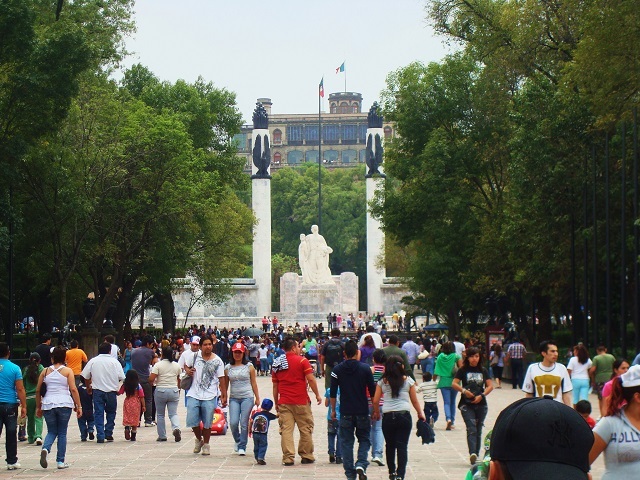 Mexico City’s Chapultepec Park attracts both residents and tourists to its pedestrian-friendly thoroughfares. Photo by Austin TX/Flickr. Vibrant parks and public spaces are invaluable in creating sustainable, people-oriented cities. Recently, 8-80 Cities and Fundacion+Espacios organized an opportunity for members of the City Parks Alliance Board of Directors – a group of city park practitioners and advocates – to travel to Mexico City to share best practices in engaging public-private partnerships that support parks. These partnerships, which expand the resource bases for cash-strapped but sustainability-focused cities, are increasingly important for realizing the value of urban parks and public spaces in attracting and keeping city residents and tourists. Throughout downtown Mexico City, city officials are fostering new connections between urban buildings and streets with parks and open spaces that bring a sense of safety and beauty for pedestrians. The city has narrowed its streets, widened its sidewalks, restored its downtown Alameda and revitalized the historic Chapultepec Park. In the Alameda, concrete sidewalks have been replaced with marble, while more reliable and aesthetic structures have succeeded tarp-covered vendor stands thanks to an infusion of US$18 million in public funding. The newly opened park, anchored by the Palacio de Bellas Artes, is a respite in the midst of this bustling city – the second largest in the world – and the small businesses surrounding the park have even seen an enormous spike in visitors. Chapultepec Park is to Mexico City what Central Park is to New York. 18 million visitors come to the park annually, 60% of which are families. To help with implementation of its 2006 master plan the city partnered with the nonprofit conservancy, Probosque Chapultepec, whose goal was to match city efforts in ensuring the preservation, rehabilitation and remodeling of Chapultepec Park. With the help of Probosque Chapultepec, the city has made progress in the three phases of remodeling Chapultepec Park. In 2008, the first phase of the park restoration won an ASLA design award, and the park now sees as many as 250,000 visitors on Sunday afternoons alone. Like many cities, Mexico City is learning how to structure and use partnerships to create, renovate, and operate parks. Chapultepec Park is a successful example of an outreach effort that stretched citywide in recognition of the park’s history and connection to urban residents. In 2001, conversations with then-Mayor Andrés Manuel López Obrador led to the organization of a Citizen’s Regent Group (Consejo Rector Ciudadano) and a Board of Donors (Fideicomiso Revive Chapultepec). Together with city officials and park administrators, these groups set themselves to the job of creating a master plan to restore the park. In an effort unprecedented for any Mexican city, half of the money for restoration was collected from individual donations, including one million donors at metro stations and supermarkets. Meeting the operating needs of the park, however, is a work in progress, and the city hopes to build on the success of its capital fundraising. Mexico City, like cities across the developed and developing worlds, has learned that maintaining signature parks – those visible and well-used central parks like Chapultepec – is challenging without long-term investment from private partners. While there is a history of welcoming partners in Mexico’s parks, particularly informal commerce, park managers are now engaging these businesses and service providers in new ways to better shape the overall park experience. This includes policies that regulate the hours of vendors so they are open when people come and improving coordination of where vendors are stationed to match demand. The collective impact of these efforts shape people’s experiences within the park. Parks play an important role in cities, serving as places of recreation and beauty, respites from concrete streets, and subtly increasing people’s appreciation of the environment and influencing the individual decision to walk or drive. Good design is important, but underlying design decisions are management choices, whether they be developing vendor relationships or creating ‘friends of the park’ groups. As urban residents and visitors come to expect more from their parks and public spaces, the role of partnerships is likely to grow with the ability of the private sector to bring value, funding, and insight into managing and sustaining parks for the benefit of diverse users while enhancing quality of life in cities.